Tasso Ham for sale. Buy online at Zingerman's Mail Order. Gourmet Gifts. Food Gifts. 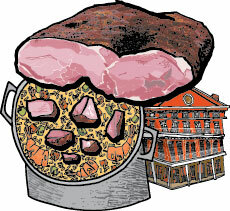 Unless you’ve spent a lot of time in southern Louisiana, you may have never heard of tasso ham. Unlike most types of ham, tasso comes from the pork shoulder not the hind legs of the hog, so it's a lot smaller. It's got a ton of flavor because the shoulder muscle—at least on the pigs that live life out-of-doors, like these—is in constant use and the meat is marbled. Made far north of the Bayou in Indianapolis, Indiana by the Smoking Goose cured meat house. The ham is covered with white pepper, marjoram, allspice and chiles before being smoked over pecan wood for nearly half a day. In Louisiana it’s cubed and used to season the heck out of jambalaya. While you might be tempted to use it on sandwiches, you’ll end up with some seriously intense sandwiches so consider yourself forewarned. This is ham that's better thought of as a flavorful ingredient to a dish, not a centerpiece. Add small chunks to stews, eggs, pasta or salads. You can eat it cool—it's already cooked and ready to go—or warmed in the sauté pan.